LANCASTER – The NAACP in the Antelope Valley is outraged by the statement from City leaders backing deputies involved in Saturday’s shooting, which left a 26-year-old Hispanic man dead. Homicide Bureau detectives with the Los Angeles County Sheriff’s Department are investigating the deputy-involved shooting, which happened around 10:55 p.m. Saturday. Christian Cobian was pulled over by a two-deputy patrol car for riding a bicycle without a light near 10th Street West and Avenue J-4 in Lancaster, according to a Sheriff’s press report. Cobian ignored deputies’ commands to stop, dropped the bicycle and fled, according to a Sheriff’s press report. Deputies gave chase, and during the pursuit, Cobian reached toward his waistband, and that’s when the deputy-involved shooting occurred, according to the Sheriff’s press report. No weapon was recovered and Cobian was pronounced dead at the scene, according to the Sheriff’s press report. Blanco said the incident may indicate a need for more formal training at the Sheriff’s Department. Conversely, Lancaster City leaders issued a statement Monday giving full support to the deputies involved. “The deputies involved in this incident and their families have the full support of Lancaster Mayor R. Rex Parris and City Council Members during this extremely difficult time when they will inevitably be second guessed by those who have never had to risk their lives while protecting the hard working families of our community,” reads the statement by City leaders. Blanco said the City’s statement is premature because the circumstances of the shooting are still being investigated. He also said the statement reflects a lack of awareness and concern for people of color in Lancaster. “There are some individuals who reside in Lancaster who do not appreciate people of color, and I don’t know if the City Council is influenced by these individuals, but by their actions and statements, it would appear so on the surface,” Blanco said. Blanco said he will be conferring with the upper management team within the NAACP on steps the organization intends to take towards communicating with Sheriff Baca about Saturday’s incident, as well as the deputy-involved shooting in Palmdale that took place three months ago. On October 13, 2011, Darrell Logan, 32, was shot 11 times by deputies who responded to Logan’s home after receiving a call about gunfire coming from the residence. Read more here. “Recent deputy-involved shootings have some citizens of Lancaster concerned about the policies of the Sheriff’s Dep[artment] regarding use of force,” said Michael P. Rives, candidate for the Lancaster City Council in the April 10th election. In a written statement issued Monday, Rives who is a former Los Angeles Police Department Technical Reserve Officer, called for civilian review boards at every contracting Sheriff’s Station in Los Angeles County. Rives wants each individual’s actions that are challenged to be reviewed by the Sheriff’s Internal Affairs Bureau and a local civilian review board before a decision is made on the deputy’s conduct. If it is criminal, then it should be referred to the District Attorney’s Office for potential review, Rives said. “My simple and uncomplicated process will promote local confidence in our local sheriff’s station and the hardworking people who work there,” Rives said. The Sheriff’s Department in 2009 created a publication to acquaint the public with the various types of life-threatening scenarios commonly faced by law enforcement officers. 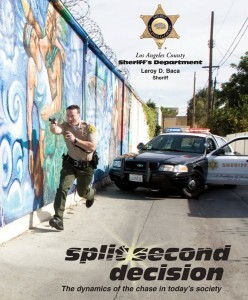 “Split Second Decision, The Dynamics of the Chase in Today’s Society” contains eight critical scenarios, based on actual events, and challenges the reader to make a decision at critical points to get an idea of what deputies must face each day in the field. The publication also contains applicable state law regarding the use of deadly force. Read the publication here. 5 comments for "NAACP blasts City leaders for comments on deputy-involved shooting"
LASD in Lancaster are just trying to cover themselves by saying he was a convicted felon & that he had a warrant.At the time when they we’re trying to pull him over or even shooting their guns they were UNAWARE of this, and they say (Sherrifs) that he was “reaching for his waistband” after firing a couple shots didn’t they figure out he was unarmed? Why did they have to fire all those shots and why couldn’t they air for him legs? They fired numerous rounds and aimed to kill, and when the investigation was complete what did they find,,, some cigaretts and a couple dollars on him, in the end there’s a grieving mother and family left behind, this is what I call abuse of authority,,, PLEASE BRING JUSTICE,,,R.I.P. CHRIS U will be missed! Criminal or not, the deceased did not have a flashing light on his back saying, “I have a warrant”. The LASD in Lancaster is just covering their backs. They had no clue of a criminal past. When they truly are informed that there is a felon harassing citizens, they have coffee with the felon and refuse to take him in, even when the felon beats up a minor child! The LASD in Lancaster is out of control!!!! I lost my dad due to unnecessary police force in 1992. That was nearly 20 years ago (this Mother’s Day will make it exactly 20 years). In Fact if you’ve ever heard of the Hammock Activity Center in Palmdale, named after the officer who was shot by their own deputies in our home when they also killed my unarmed dad who was sick in bed. That being said, the police do have to make split second decisions and they are often going on bad information that they don’t have time to research for accuracy. It’s sad the man lost his life… but if there’s nothing to hide, why run? Good citizens would (normally) stop and comply. I think the focus on race is wrong. It focuses too much attention on the color of someone’s skin (which is what the supposed problem is in the first place, so it’s just making it worse). I’m white as white can get (though I have friends & family of ever race, color, nationality) & the police have been horrible to my family here in the AV despite that I’m white. It’s sad he lost his life, I think there’s a lot to learn on both sides (respect the police authority, let them do their jobs, don’t run or make them feel threatend) and the police should be less quick to fire their guns and that’s where the focus should be, not on “let’s blame the police for being racist”.